Table of Contents Next: Glover, Robert O.
Gliders are unpowered aircraft that are towed to their operating area by a large powered aircraft such as a transport. They are used to land men and equipment in support of an airborne attack. They are particularly valuable for their ability to bring in small artillery guns or very light tanks, which add considerably to the firepower of the paratroops. The U.S. Army first began experimentation with gliders in July 1941 at Wright Field, but by then the Germans had already employed glider forces in combat in Belgium and Greece. The first U.S. glider battalion was organized in May 1942, and the glider force numbered 13,000 gliders and over 10,000 pilots by the end of the war. The U.S. Marines experimented with gliders, but found them unsuitable for Pacific operations, and the Marine glider force nubered just 21 gliders and 282 troops when it was disbanded. Allied use of gliders was largely restricted to the Burma theater, where they were used to insert deep raiding forces, such as the Chindits, or to resupply isolated conventional ground units. The first use of gliders by the Allies in the Pacific was by 511 Parachute Regiment at Aparri on 23 June 1945, but 6 Army troops had already seized the town by the time the airborne troops arrived. 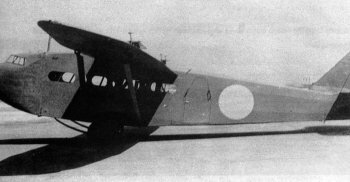 The Japanese used a few obsolete transports in the glider role during the Centrifugal Offensive, but did not develop a true glider in time to see use in combat. However, the Ku-8 "Gander" saw service resupplying isolated conventional ground forces in the Philippines.